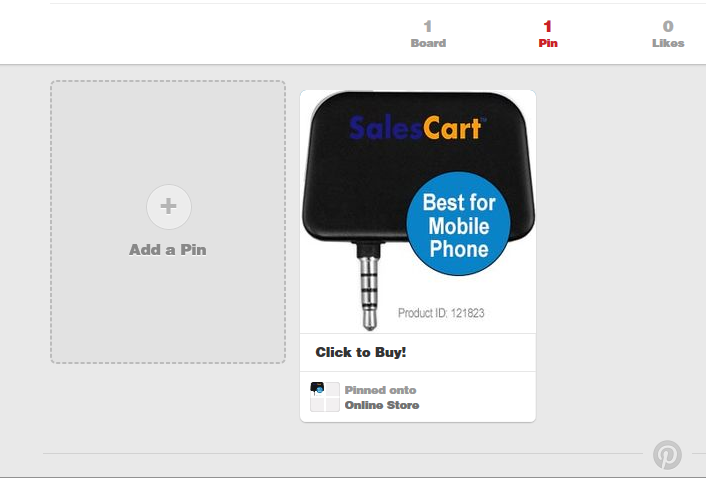 With SalesCart (http://www.salescart.com), you can setup a Pinterest (https://www.pinterest.com/) online store as fast as you can click a few buttons. It is free for the first 10 products, and it is also very simple. In fact, it is so easy to build your Pinterest Store that you can literally list a new product every 5-10 seconds. Pinterest has been sneaking up on Facebook and Twitter as a social media powerhouse for quite some time. In 2015, it is expected that nearly 50 million users will use Pinterest (www.pinterest.com) and that’s just in the U.S. 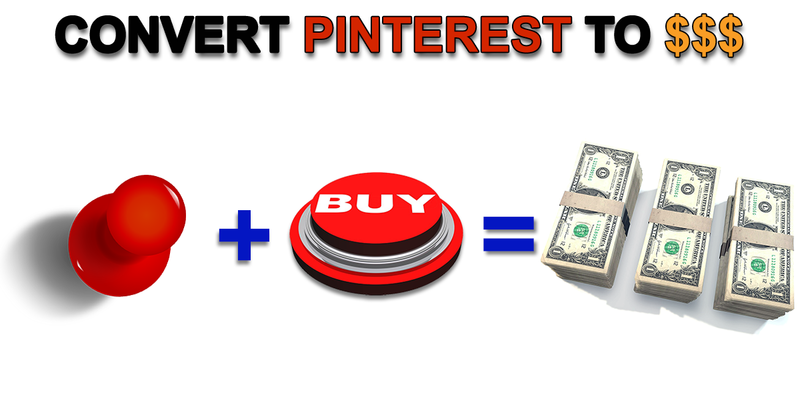 Selling on Pinterest is an opportunity that most online businesses have yet to tap into. It is a great new potential to get products in front of over 50 million eyes. What makes Pinterest such a unique new social sales platform is that pinned products can literally self-promote like a viral sales force who are working for free. Step 1: Build your free SalesCart store by visiting http://www.salescart.com and clicking on the Start Now button or by going directly to http://www.salescart.com/FaceBook/Getting-Started/default.html#FreeStore. Also, setup a Pinterest business account. Step 2: Once the products have been added, visit your Facebook store or Mobile store and view each product, click on the tab labeled Tell Others, and then click on the Pinterest button. Step 3: A new window in Pinterest will be launched. If this is the first product you are adding, click on the “+ Create a board”, click your mouse in the name field and type “Online Store” and press Create Board. Finally, click on the board and click on the Pin It button. That’s it! 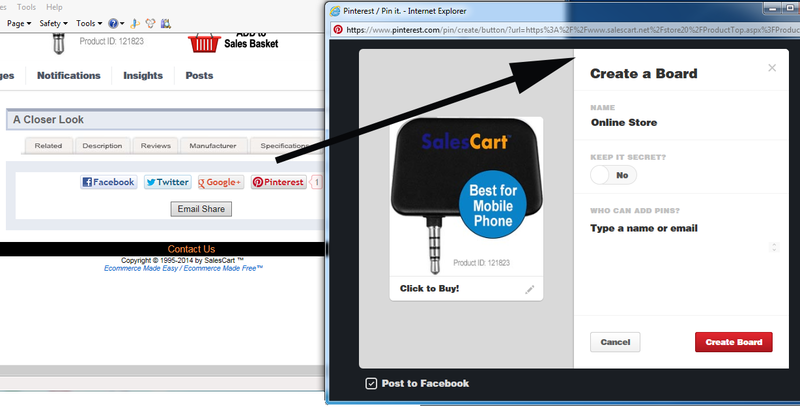 When someone clicks on your Pin Image, they will go directly to your store and to your product page to buy the product. Your recent pins will also show up in Facebook if you have Pinterest enabled to share with Facebook. Just delete a pin and re-add it to update an image if you need to. 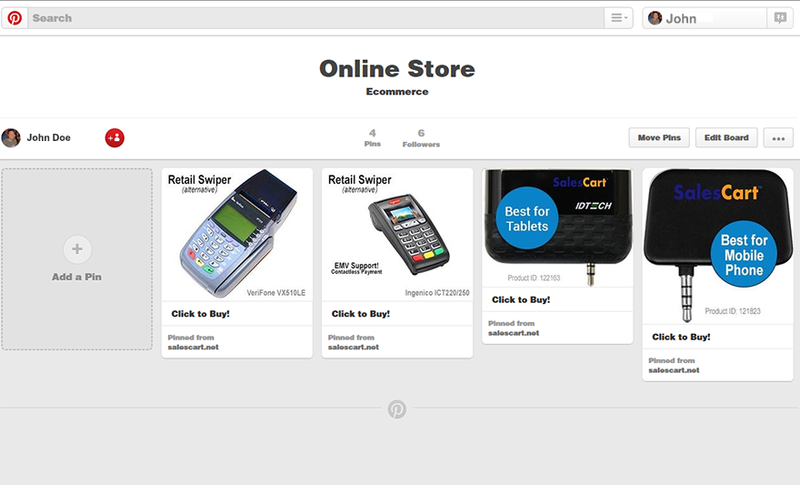 Here’s what a final Online Store board might potentially look like. SalesCart makes it easy and secure to sell on social websites like Pinterest, and Facebook. It takes less than 10 seconds per product and anyone can do it. SalesCart allows you to sell up to 10 products for free and since both Pinterest and Facebook are free, you have a ready-made social avenue to distribute and sell your products, or start-up any business, without spending a dime.